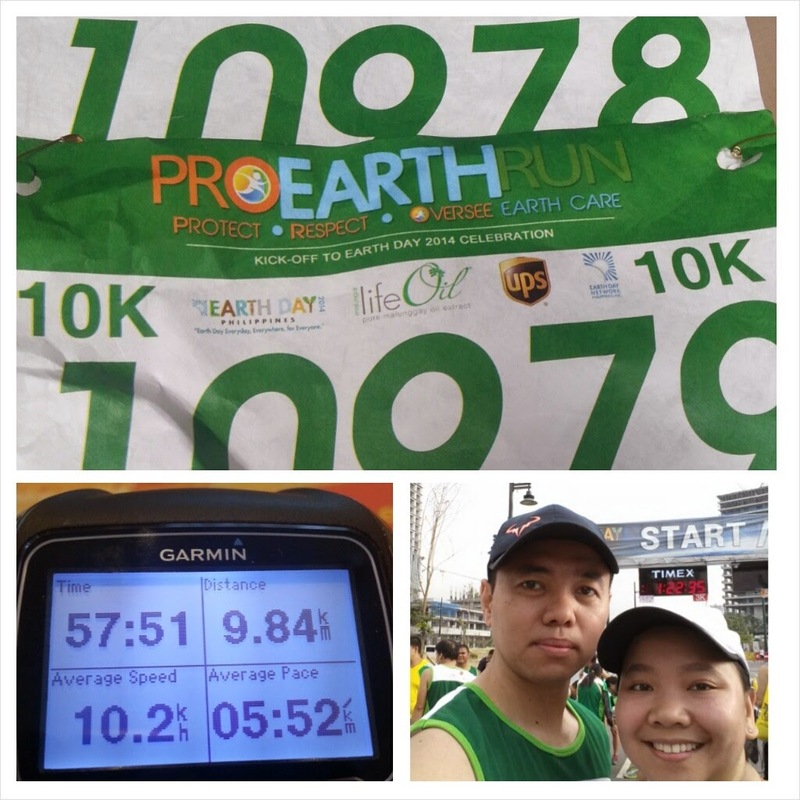 Pro Earth Run was my 2nd 10K-race with Irish and first Saturday race. The event was somewhat a kick-off activity for the Earth Day celebration on April 22. The event was not as big as the Run United or 7-11 runs so the road was not crowded. There were probably around 1,000 10K runners. Irish and I positioned near the front of the pack but we separated immediately after the gun start as I was aiming for sub-1. The route is quite similar to that of the Financial Run 2014. I took my first hydration at the Kalayaan flyover at about 4km mark and thought of having one more stop on my way back. When I checked my clock at the UTurn near Paseo it was 27mins and few seconds - still on target. But before reaching the flyover, I started to feel tired so I slowly dropped my pace and walked for about 200 meters to catch my breath before tackling the flyover again. As usual, I couldn't finish the flyover without walking! I had few more walks before the finish line. Hopefully I could improve to lessen my walking time next time. I crossed the finish line at an unofficial time of 57mins 51secs. Irish at about 1hr 42 minutes - a little bit faster than her United Run 1 2014 time.